Like many heritage attractions, York Castle Museum presents a family oriented environment with a variety of exhibits that are primarily educational. The museum’s WW1 exhibition gives families the chance to experience what life was like for soldiers during the war, while children are encouraged to interact with historic objects at the various ‘Hands On’ stations. Older generations can then enjoy reminiscing about their favourite childhood toys at the current ‘Toy Stories’ exhibition before stepping back into the colourful 1960’s in ‘The Sixties’ gallery. Visitors are then permitted to venture down into the former prison cells where the experiences of inmates are told via projections that provide an interactive experience. Though stimulating enough to keep children entertained and parents amused on a family day out, it is fair to say that a more critical heritage visitor might find some of the exhibits tired and intellectually uninspiring. That being said, few could deny the charm of the museum’s main attraction, the recreated Victorian street, Kirkgate. Wandering down the cobbled street immersed in the sights and sounds of this picturesque portrayal of Victorian York, you are given the chance to see shops filled with traditional sweets, clothing and books, as well as dark alleyways that present a less idyllic side to the story. While exploring Kirkgate Street, you will be confronted with hosts dressed in period costume, the use of costumed interpreters such as this is a particularly polarising theme in heritage sites. With many visitors increasingly striving for museums that present history in a way which is entertaining, dynamic and animated, the implementation of costumed interpreters can transform the historic environment into ‘living history’ and meet with this demand. Yet for many, costumed interpretation can be awkward, off-putting and overtly fake or theatrical. Within the York Castle Museum, interpreters are by no means trained actors presenting a scripted history to the public, they are simply present in costume for the public to converse with and direct questions to. While inside one of the shops we overhead the costumed ‘shopkeeper’ discussing the industrial revolution with members of the public while others in Victorian dress simply smiled and awaited questions. Assuming all hosts are well trained, the use of costumed interpretation at the York Castle Museum can be seen to provide an informative resource for visitors willing to engage in conversation, particularly for those who do not usually spend time reading information panels or guidebooks. The informal nature of this method of interpretation certainly has its benefits, yet for visitors who are uncomfortable with the prospect, there is little to no other written guidance available within the Victorian street, leading to a significant gap in visitor learning. Costumed interpreters at the York Castle Museum certainly play an important role in contributing to the atmosphere of the site and overall visitor experience if actively engaged with, but if ignored, like many features within the space, this aspect of the street is merely decorative. Authenticity is a really big issue in heritage. You might not think it but authenticity and being authentic is the cornerstone of the heritage industry. When you visit a museum, art exhibit, or monument, you are placing your trust with the heritage experts that run the exhibit to provide an accurate and authentic viewer experience. If you don’t think that authenticity is that important in a heritage site, or that what they don’t know won’t hurt them, think of it this way- a museum is basically a printer, reprinting knowledge, if a problem occurred with the original print, like a ink spot or smudge, the future copies would have the inaccuracies within them. Or imagine that there was a museum that only used chinese whispers in order to teach history, the truth would be lost and altered the longer it was whispered. This makes authenticity really important then when it comes to heritage and museums because the more authentic the experience, the better the education provided. However many museums such as the York Castle Museum use authenticity in such a way as to create their own story and ‘narrative’ of events, as well as having some historical inaccuracies on display. When walking through the Castle Museum, you get a sense of stepping back into the past, passing numerous displays of typical historical interiors such as the Edwardian living room and the Victorian kitchen. While these might seem like authentic examples of commonplace historical interiors, in the exhibits we identified a number of inaccuracies which could undermine the authenticity of the exhibit. It was interesting when we approached the first interior exhibit to find that half of our group didn’t see that glaring inaccuracy right in front of them, and only gasped in horror when it was pointed out to them. Why anyone editor working at Period Homes in the 1970’s thought it was a great idea to put plates on the wall is beyond me! But still this popular idea prevails, with examples troupes such as the medieval manor, the period country cottage and the Edwardian home. Popularised by magazines like Period Homes (other inaccurate magazines are available) misconceived ideas of historical inaccuracy are replayed over and over again in the popular mindset. Walking down the Victorian street, you are confronted with a dark and overwhelming sensory experience of factory made smells and ‘old world’ ambient sounds. I’m not saying that the Street Life experience fails in it’s attempt to create a sensory experience. Far from it! On the service it engages and intrigues the audience who are free to meander around the street at their leisure. As nice as the exhibit seems it certainly is not authentic. The depiction of Victorian life that it presents is very idealistic, surprising for a museum that was founded on the sight of a women’s jail, and presents the audience with a street straight from a Dickensian novel rather than the gritty reality. The recreated Victorian street, Kirkgate, is well designed and organised cleverly. While I walked through the Period Room exhibits, a view of the recreated Victorian Street could be seen through a glass window with an information board on the right. Suddenly, it became apparent that I was in a building on the street. When I saw people were walking on Kirkgate as if they were part of the scene, I realised that they maybe saw me as a ‘resident’ in the building. The people make the scene alive in comparison to the traditional glass box exhibition. Kirkgate gives visitors an experience of exploring the Victorian era in York. Not only children but also adults would get excited and look forward to visiting this ‘real’ street. Additionally, the museum has considered that some visitors would like to take a photo through the window, to allow for this, two glasses in the middle have been removed and visitors can take a high quality image of the Victorian street. 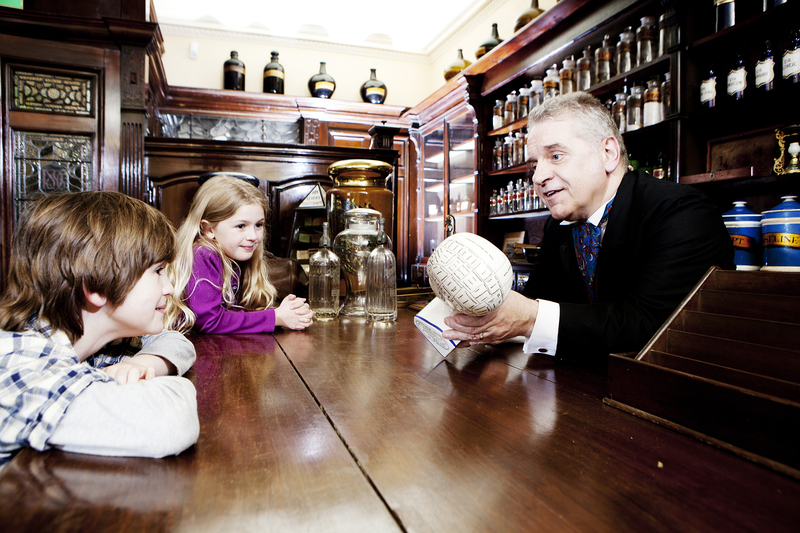 A visit to York Castle Museum makes clear that the Victorian street is the most famous exhibition in the museum. The background information gives the audience an idea of the life of the rich and the poor and every shop has been based on real businesses that have existed in York. The audiences are encouraged to discover the shops for the rich, the working class, or both. Even without a History background, you can also receive the concept that the museum is trying to sell. Through this, the museum acts as a business man or a shop owner, displaying its collections in the shops. The visitors can not only window shop to see the goods that were sold in Victorian times, but also have a chance to try on a ‘new season hat’ or buy sweets in the shops. Walking on the large Kirkgate street, the public can experience a day in the shoes of the rich, shopping imported fine teas and coffees and watching a horse-drawn carriage on a thundery night in just twenty minutes. Kirkgate provides an immersive environment partly due to the recreated shops, but more so because of the gradually changing lighting, from day to night, the background sounds of the street and a realistically cobbled floor. The backstreets of Kirkgate, where the poor would have lived and worked, stands in sharp contrast to the shopping street. The small, dark and grimy streets provide the feeling of oppression. The success of the contrast can be largely credited to the use of ‘authentic’ smells for the environment. Overall, Kirkgate provides an immersive historical environment for all to experience and enjoy. Its success is partly due to the creative interpretation, the design of the shops and their physical settings, but more can be credited to the people, the costumed ‘shopkeepers’ and the visitors, acting themselves as performers in the exhibition.